by Anna Getty is a great book to help you get a head start on greening the winter holidays. 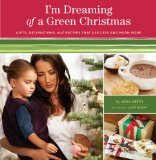 I’m Dreaming of a Green Christmas is a fabulous book full of tips, expert advice, crafts, recipes, decorating ideas and directions and pretty much everything you need to make the holidays more eco-friendly. I really like this book. The holidays are always a little bit stressful no matter how well you plan or prepare. When money is an issue it can get really stressful. One thing I really adore about I’m Dreaming of a Green Christmas is that so many of the crafts for gifts and decorations are made with items I have lying around the house. So I can make decorations and gifts without spending a dime. The crafts I love the most are the: decorated matchboxes (page 70-71), the salt dough ornaments (page 90-91) these are so very country Christmas I love them, the old fashioned cranberry and popcorn garland (page 104-105), the cute little twig stars (page 106-107), t-shirt potholders (page 134-135) of course I’ll pass this on to my mom since I don’t sew, the vintage button clutch (page 136-137), and the bottle cap refrigerator magnets that are so super cute for kids to make (pages 142-143). And the recipes sound so yummy: roasted acorn squash soup with Parmesan and crispy sage, stuffed mushrooms, artichoke dip with baked pita chips, mini apple strudels with brown sugar whipped cream, pumpkin gnocchi with browned sage butter, pumpkin butter and tamari roasted pumpkin seeds, chai hot cocoa with whipped cream…and so many more. Now this is just a sampling of the crafts and recipes this book has to offer in addition to all the amazing advice that doesn’t preach but offers honest and traditional old fashioned style charm to help return Christmas to the love and joy that it originally was. This book can help you have the type of Christmas you’ve always dreamed of without the stress and hassle and worry of commerical sparkle and false joy. This book hit stores today so grab a copy and get a headstart on your greenest Christmas ever.